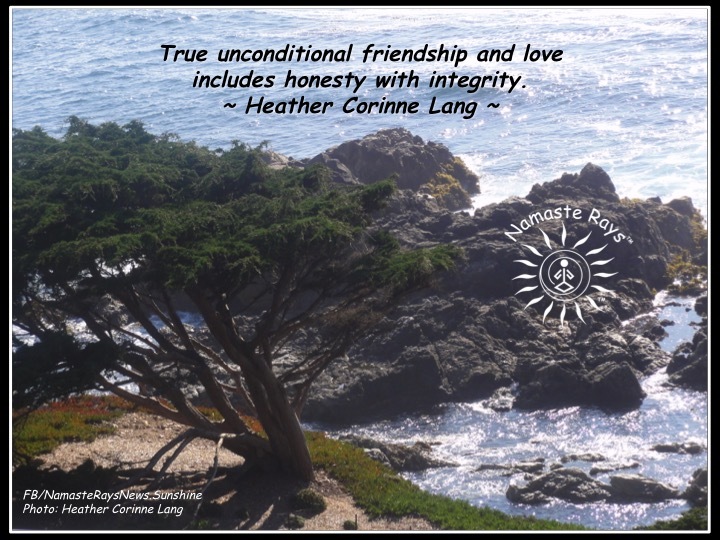 True unconditional friendship and love includes honesty with integrity. Friendship and love without integrity is not true or unconditional. Integrity is the cornerstone of being your authentic self, helping to cultivate real and true relationships. It is about being honest with both yourself and another. It is recognizing in a relationship what you have ownership of whether it’s your participation, thoughts, feelings and/or actions/reactions. Basically, “this is my stuff, and that is your stuff.” Integrity is being truthful with ourselves and our part in a relationship, experience or situation, and allowing the other person to recognize their part without force, cajoling, persuasion or manipulation. If the other person does not recognize their part, that person may not be ready to accept any issues within themselves. Using your integrity for your highest good brings you growth and transformation. Integrity involves staying true to yourself, and treating others with the understanding, respect and compassion they deserve. It involves walking your talk with yourself and everyone, especially those you love and consider friends. It does not include gossip, drama, chaos or talking poorly of people to others. It does not include being kind to someone in person and not kind to them when they are not around. It is both knowing and understanding everyone has a different set of experiences and circumstances which frame their knowledge, thoughts and opinions, while accepting and acknowledging they may be different than yours. Differences are simply different, they are not categorized as right or wrong. Integrity keeps us balanced with our egos; it helps increase our kindness & compassion by allowing us to consider all aspects of ourselves; and it provides us the barometer in which a life of true and unconditional relationships are able to be present. Only with integrity can true unconditional friendship and love exist and flourish. If you would like guidance in your relationships, or any other service, please email me at heatherclang@yahoo.com. Hii Heather,! Thank you for your kind words. Enjoy the winter weekend. Namaste. You are welcome, Celia! Thank you for leaving your thoughts. Happy Friday & Namaste sweet soul! Thank you Renae! Yes I agree! However, for those of us who do, we find the most incredible, loving, compassion and kind people and relationships! Namaste my friend!